Are you afraid of getting cancer? Then you need to know about everyday superfoods that are so powerful in preventing this deadly disease that they can cut your chances of getting cancer in half. These superfoods can help even in cases where there is a genetic connection, by providing conditions where “the bad gene” doesn’t get activated. Many people think of cancer as a genetic disease, yet science relates only 5% of cancer cases to the unlucky genes. Doctors tell us to stop smoking and drinking alcohol to prevent cancer, yet quitting tobacco and alcohol together may improve our chances by 35% only. The biggest factor in cancer prevention is your diet, the foods you choose to eat day in and day out. Based on thousands of studies, US Cancer Institute suggests that the right diet can prevent cancer in 35% to 60% of cases! The best foods that meet all three of these requirements are vegetables, fruit, and spices. Not only veggies are high in fiber and low in fat, they also contain a lot of natural antioxidants. Dark colors of your veggies are usually caused by pigments with strong antioxidant qualities. Vitamin C and E and some other micro elements have the same effect. How to make sure that your odds of escaping cancer are the highest? While science agrees with your mom who told you to eat your vegetables, there are top superfoods that you should remember to eat every day for the best protection. 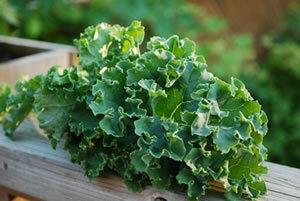 Kale is a green leafy vegetable that is currently considered the queen of superfoods. Kale lowers risk of at least 5 types of cancers: bladder, breast, colon, ovary, and prostate due to record 45 flavonoids with antioxidant and anti-inflammatory effects and high fiber content. Note that kale interacts with blood thinners due to its high Vitamin K content, so make sure doctor adjusts your medication accordingly. Cabbage (white, red and Savoy) is used widely in European and Asian cooking. Pickled cabbage, fermented with salt, delivers the most overall health benefits. Its anti-cancer benefits are attributed to glucosinolates that help prevent bladder cancer, breast cancer, colon cancer, and prostate cancer. One study even attributes lower lung cancer rate among Polish population as compared to the North American, to the cabbage being the popular everyday food. Although the Poles smoke much more than the Americans, they don’t get lung cancer nearly as often as Americans do. If you usually don’t eat much cabbage, try new Cabbage Recipes and you might find the ones that please your palate and protect you from cancer. Aloo gobi is good for you. Cauliflower in it is linked to prevention of prostate and breast cancer. It contains a special family of enzymes that work on the DNA level and can impact expression ( or not) of certain genes, such as tumor suppressor gene. Awesome cuisine has the best collection of Cauliflower Recipes ever, so make sure to put one in your menu regularly. Did you know that top cancer fighting vegetables: kale, cabbage, cauliflower, broccoli and Brussels Sprouts are all coming from the same family? Broccoli is rich in compounds called ITCs, which help destroy the result of the mutation of the gene that causes cancer, and suppress the development of tumor. Try the Broccoli Recipes at Awesome Cuisine for you to choose from. Curry spice turmenic contains curcumin, a powerful anticancer phytonutrient that is also gentle to the body. Frequent turmenic consumption is linked to lower rates of prostate, breast, lung and colon cancer. Even when the breast cancer is already present, studies show that use of turmenic helps in slowing its spread. Scientists think that curcumin helps body to destroy mutated cancer cells by enhancing liver function. Breast cancer rates are on the rise, so it is a good idea for women to eat more turmenic. Try Cauliflower Dry Curry Recipe for it contains two powerful cancer fighting agents, or choose your favourite curry from Awesome Cuisine’s extensive Curries and Gravies list. Several population studies show an association between increased intake of garlic and reduced risk of certain cancers, including cancers of the colon, stomach, pancreas, esophagus, and breast. Garlic can be taken as an extract or powder, however, raw garlic has the most benefit. Add garlic to your meals generously, it will also protect you from flu, just make sure you are aware of possible interactions with prescription drugs, and don’t take it if you have ulcer. Check out these Garlic recipes and start cooking! Onion and garlic are from the same Allium family. Onions are rich in a flavor compound quercetin, a potent antioxidant that has been linked to protection and fighting against liver and colon cancer. Onion juice therapy is becoming a popular anti-cancer remedy, just as more and more researches confirm onion’s reputation as a plant that treats many diseases. “Although milder onions are becoming more popular, the bitter and more pungent onions seem to have more flavonoid compounds and appear to be more healthful,” says Rui Hai Liu, M.D., Ph.D., a chemist with Cornell’s Department of Food Science in Ithaca, N.Y who led the most recent research. Check out red grapes, pomegranate, tomato, papaya, lemons and grapefruit – these are top cancer preventing fruit. As you can see, wholesome everyday dishes that your grandma cooked were good for cancer prevention. The last word of advice for you is to eat these super food veggies with spices (horseradish, cayenne pepper, garlic, curry) and a little bit of oil. This is because spices enhance cancer fighting abilities of these veggies, and a little bit of oil is needed for the absorption of the oil-soluble vitamins, such as Vitamin A. Try to reduce overall amount of fat you are using, and increase your fiber intake. When people receive their cancer diagnosis, they often start researching natural remedies. They discover, sometimes too late, that foods they were routinely NOT eating could have saved them from this pain. Don’t become cancer statistics – eat these super foods every day and live a long, happy life. Olga Krakovna from Choose Healthy Food strongly believes in using food for disease prevention. She researches health benefits of foods and then finds ways to incorporate superfoods in the everyday diet. Her easy and healthy recipes that taste great, as well as interviews of people prominent in the field of nutrition, are posted on her website. Feel free to comment or share your thoughts on this "Top Seven Superfoods That Prevent Cancer" article from Awesome Cuisine.